The T-44-122 is a Soviet tier 7 premium medium tank. Developed in February 1944, based on the T-44. As compared to its predecessor, the vehicle featured a different hull, turret, armor, and armament. The powerful 122 mm D-25-44T gun mounted on the tank resulted in the reduction of the ammo load and complications with loading a quick-firing round. The separate loading system was deemed redundant due to a low rate of fire, and the T-44-122 was re-equipped with a 85 mm gun. The T-44-122 is currently not available to regular players, although it may be available to press accounts and testers. At Christmas time 2015, its appeared on the Asia sever as a moderators' gift. Its model and statistics are in the game files and can be viewed in third-party programs. 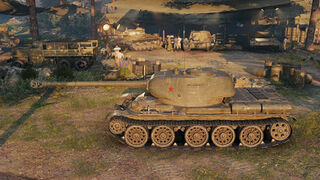 This vehicle, however, is found in World Of Tanks Blitz. It has the buffed version of the T-44's 122 mm D-25-44 gun. Very good credit generation coefficient, even better than some tier 8 premium tanks. Great mobility, and very good agility. Four-man crew configuration; works well for training higher-tier Russian medium tank crews. Preferred Match Making (MM+1). 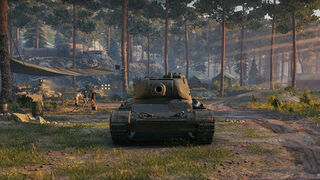 This means the T-44-122 only meets Tier 7 and Tier 8 tanks, like the E-25, Pz.M10 and AT-15A. Uncomfortable gun depression, long aim and reload time and poor accuracy. Fragile modules, very vulnerable to damage, ammo racks and fires. Armour cannot be relied too much when facing tier 7 tanks and above. Very low Damage per minute. Essentially a T-44 with a 122mm D-25-44, the T-44-122 has a similar play style to the T-44 or T-34-2 equipped with a 122mm gun. To make best use of the high damage and low dpm of the gun, use of peekaboo tactics to minimize exposure. Keep distance and take cover from enemy tanks, peek out and hit them hard with the infamous Soviet's 122 mm Gun D-25T (which can be found in most Soviet Heavy tanks like the IS, IS-2, KV-3 and IS-6)and retreat to cover. Early in the battle, use your speed to take advantage to spot before enemy, aim beforehand, hit them right when they appear and fallback, wait for teammates. Don't overextend as you can easily be swarmed and killed thanks to your low dpm. During mid game, work as a second line support tank. In late game, use your high damage gun and mobility to carry/KS. 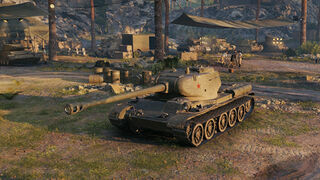 In addition, the T-44-122 reloads faster than the tier 8 T-44 equipped with the 122 mm D25-44 gun. Overall, the T-44-122 has the Tier 8 mediums mobility, tier 8 Pack-a-punch gun, very good credits making ability and especially MM+1 (meets only tier 7 and 8), make this tank very strong, and it is like a monster when played by a good/unicum player. It even works best in tier 9 battles (platoon). Just don't get hit from anything. As a premium tank, it is generally not recommended that a dedicated crew to be run on the T-44-122. Instead, one should use an existing Soviet medium tank crew. If none exists, however, then the following options are probably the most viable. A more specialized set of first skills would be Repair (Commander and Loader), Snap Shot (Gunner), and Smooth Ride (Driver). The loader only has perks available, which are not useful until they have reached 100%. Repair is the most viable option for the loader, which may later be swapped out for his perks. The combination of Snap Shot and Smooth Ride act like a Vertical Stabilizer, reducing the accuracy penalties while moving in a straight line or turning the turret. This can make a significant difference, especially given the T-44-122's terrible dispersion and aim time. Mentor may also be used instead of Repair if the emphasis is on getting the other crew members' skills up faster. Smooth Ride may be substituted with Off-Road Driving for improved overall mobility or Clutch Braking, which is always useful on any medium tank for the increased hull traverse, allowing them to circling enemy tanks better. Upon reaching 100% on the first skills, dropping the commander's skill for Sixth Sense is highly advised, as it is one of the most important perks in the game. The loader's skill may be dropped in favour of Safe Stowage. Brothers-in-Arms is a good perk to have on any tank, but requires all crew members to have it at 100% before it works. The bonus to crew skills is particularly noticeable when combined with Improved Ventilation. It improves nearly every aspect of the tank's performance, but is generally better saved for later in favour of more important skills and perks like Repair and Sixth Sense. As a premium tank, the T-44-122 has no upgrades. In the autumn of 1943 the design bureau of the Stalin Ural Tank Factory No. 183, located in Nizhny Tagil (in the Ural Mountains, where most of the Soviet tank industry had been evacuated after Operation Barbarossa in 1941), started working on a vehicle that would have improvement opportunities in the future, under a direct order from Joseph Stalin. The intention was to retain the high mobility of the T-34 and provide it with heavier armour protection against modern tank guns. In November 1943, the chief designer, A. A. Morozov, presented the overall design of the vehicle and a model of the tank, which received the designation T-44 (Ob'yekt 136). The first prototype was completed by January 1944 and two more were completed in February. The first two prototypes were armed with 85 mm D-5T guns and received the designation T-44-85, while the third prototype was armed with the 122 mm D-25-44T tank gun and received the designation T-44-122. The D-25-44T tank gun was very similar to the basic D-25 field gun, but differed in some minor details including fixed single-piece ammunition to increase the rate of fire and a double-baffle muzzle brake. What allowed fitting such powerful armament in a medium tank weighing 30 tonnes was the construction of the hull with an innovative placement of the engine. Unlike most tanks, in the T-44 the engine was placed perpendicular to the axis of the tank. The hull was designed without sponsons. It was also much wider which made the crew compartment bigger and allowed the turret to be placed over the center part of the vehicle. This reduced the overall length of the vehicle. A big disadvantage to the vehicle was that its ammo rack was on the broad left side and was easily hit, often resulting in detonation of the ammo rack, which caused a lethal explosion. The thickness of the armour was 75 mm on the front of the hull and 90 mm on the front of the turret. The side armour was 45 mm thick and could be reinforced by 30 mm thick additional armour plate. All three prototypes were powered by the V-2IS diesel engine which developed 500 hp (373 kW). This first generation of prototypes featured a raised cast driver's hatch with an opening vision flap as well as mounting bolts in a ring around the base of the gun tube. Morozov's new medium tank design received a skeptical response. It was believed that putting a high-speed 12-cylinder engine with a working displacement of almost 40 liters perpendicular to the direction of travel would cause problems, including breaking the connecting rods. It was believed that decreasing the displacement of the engine compartment for the purpose of enlarging the fighting compartment was unnecessary and that moving the turret rearwards would limit the elevation angle of the main gun. However, it turned out that even though rotating the engine complicated the transmission by introducing an additional reduction gear - gear-train and fan drive, it also solved many problems. The cover of the engine and transmission compartment turned along with the radiator; this allowed easier access to the engine, transmission and batteries. The significant decrease in the length of the engine compartment allowed the turret to be moved rearwards, which in turn moved its rotation axis and the center of mass to the center of the hull, increased the accuracy of the main gun and decreased a chance that the turret could get stuck after getting hit in the turret ring with a projectile that ricocheted. The thickness of the frontal armor protection more than doubled without disturbing the center of mass or drastically increasing the weight of the tank. At the beginning of World War II the thickness of T-34 armor was considered enough. Improvements made to the T-34 during World War II included increasing the caliber of the gun (from 76.2 mm to 85 mm) and thickening the armor of the turret. No significant improvements were made to the hull. Increasing the size of the fighting compartment allowed the removal of floor ammunition stowage. The height of the tank was decreased by 300 mm, even though the turret remained almost the same. Removal of the conical pair in the transmission permitted fitting a more compact gear box and improved the control of the brakes and the steering clutch. Visibility from the driver's position was improved. The driver was protected from being splashed by water while the vehicle was fording. The new torsion bar suspension allowed easier crossing of rough ground. 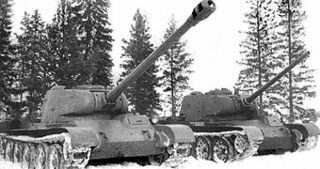 The first trials of the T-44-122 prototype took place in February and March 1944, but were unsuccessful due to gun failure, and the gun was returned to the No. 9 factory for repair. In April and May 1944 the trials were resumed. Aside from standard trials, the T-44-122 was put in competitive trials against the captured German Panzerkampfwagen V Panther medium tank and the second of two first generation T-44-85 prototypes. The practical rate of fire was two to three rounds per minute due to the cramped turret and long, heavy ammunition. The vehicle had a very limited storage of only 24 rounds and this was considered insufficient for a medium tank. As a result, all further development of the T-44-122 prototype was cancelled. Like the T-44-122 prototype, one of the two first-generation T-44-85 prototypes went through competitive trials against the captured German Panzerkampfwagen V Panther medium tank. The second of the two first-generation T-44-85 prototypes was put in competitive trials against the T-44-122 prototype. The second prototype uncovered additional faults in the design. By May 1944 two second-generation prototypes were being built. These featured the driver's position moved rearwards so that his hatch was partially on the hull roof. The driver's vision flap was reduced to a plain square flap with rounded lower corners, in line with the glacis plate. These prototypes had prominent collars at the base of the gun tube, without the mounting bolts which were present in the first generation prototypes. The two prototypes also have differences between each other. One prototype had a splashboard on the glacis plate while the other had a smooth uncluttered glacis plate. One of these prototypes passed trials at the NIBT proving grounds near Kubinka in June and July 1944. This prototype weighed 31.3 tonnes and was armed with an 85 mm ZiS-S-53 gun. The turret front armour thickness was increased to 115 mm. Hulls side armour thickness was increased to 75 mm. This page was last modified on 23 October 2016, at 20:18. This page has been accessed 29,547 times.